Microsoft is planning to launch a program of updates for Windows 8 – Windows 8 Pro Upgrade for those who will purchase Windows 7 after June. The update for these people would cost $15 for users of Windows 7 Home Premium or higher, which will be updated to Windows 8 Pro. Although the value is lower than the retail price of the operating system, remember that Vista users were upgraded for free to Windows 7 in June 2009. 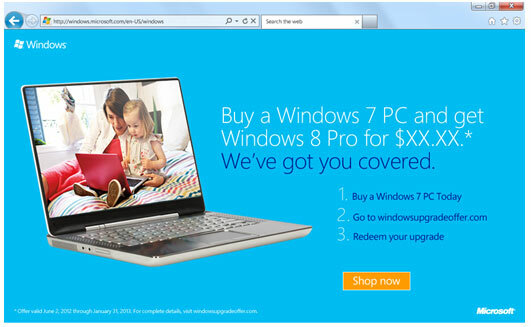 Microsoft will only offer two versions of Windows: Windows 8 and Windows 8 Pro. Instead of offering the free upgrade to the basic version, decided to offer the Pro version in return for payment. We’ll see if it is effective. In addition to Windows 8 Pro Upgrade offer, Microsoft will also provide in-the-box upgrades to Windows 8 users that provide Windows 8 Pro and Windows Media Center capabilities. These upgrade packs replace the old Windows Anywhere Upgrade system and will be available through a new interface called Add Features to Windows 8. To remind you, Windows 8 Consumer Preview, on the very first day, hits 1 million downloads. Windows 8 Pro Upgrade offer will start on or around June 2, 2012, the same time when Microsoft delivers the Release Candidate of Windows 8 and last through January, 2013. If you want to try the windows 8 beta, then you can download it now.